Since 2012, Slippery Rock University has partnered with Amizade to connect students to community sites in Jamaica, Bolivia, and Puerto Rico. Slippery Rock is unique in their program structure, empowering students to coordinate and lead a group of their peers on these incredible experiences. 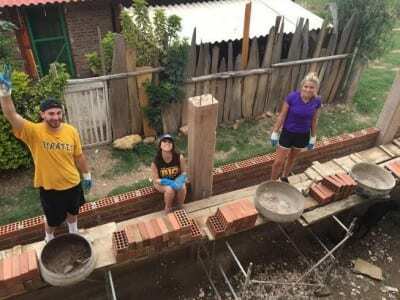 Jamie Romine and Anna Buffalini traveled with Amizade to Jamaica in 2015 and then, in 2016, they served as student leaders for a trip to Bolivia. Today, Jamie and Anna shared their experience planning and leading an Amizade program to Bolivia! Have you ever been interested in being involved in service work that affects a community in a life-changing and positive way? Let’s take it one step further. Have you ever wanted to participate in service work while having the opportunity to see the world while you’re at it? Maybe this is something you’ve always wanted to be a part of but you didn’t know how to go about it. Through Amizade as well as our school, Slippery Rock University, we had the opportunity to immerse ourselves in a culture while also participating in service work with some of the most wonderful individuals we have ever encountered. We took a group of twelve students to Cochabamba, Bolivia this past winter and had the experience of a lifetime. From participating in the different aspects of life in Bolivia we were able to experience their food, architecture, and values. 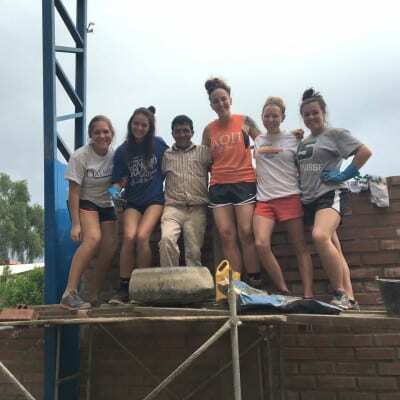 We also engaged in service work at a school where we did projects such as tiling, laying bricks, and mixing cement. Giving students the chance to have some of these experiences is all the reward you’ll need when it comes to leading a volunteer trip. There are different types of volunteer trips that Amizade offers based on what will best suit different individual’s interests. They range from working with children in schools to hands on construction work, which we were doing in Bolivia. Once you figure out where on the map you want to end up, you need to decide how you’re going to recruit participants. For us, this was one of the hardest aspects of planning a volunteer trip due to how expensive they can be as well as the timing of the trip. Depending on how many people you will be taking on your trip, you could utilize an application process or choose to take all those who apply to the general program. Fortunately, for us, we had a faculty advisor and two leads which made it possible for us to take a larger group; therefore, we used the application process for our trip. Once our group was secured, the next step was to focus on plane tickets so that they can be purchased as inexpensively as possible. As your departure for the trip approaches, plane tickets can drastically rise in price so we recommend securing these as soon as possible. Another important part of planning a volunteer trip is holding meetings for all of the participants to attend. We had around five meetings before our departure, which encouraged group bonding as well as established expectations and behavior (such as language barriers, what to expect, and how to best navigate the new culture you’re entering). To our relief, Amizade is extremely helpful with the rest of the process and made our jobs as group leads a breeze! Something that was helpful was having a faculty member with us who spoke the native language of Bolivia, Spanish. If you plan a trip to a country that does not speak your language we highly recommend that you try to find a participant interested in going who does. Something else that allowed our trip to go as smoothly as it did was providing folders for each student with items provided to us by Amizade such as an itinerary, emergency contacts, flight information, and copies of insurance for when we arrived at the airport. We found that these folders allowed for fewer complications during our travel time together as a group. Amizade was a wonderful organization to plan an international trip with and we had almost no issues or negative aspects when it came to planning this journey. From the amazing site directors that you will meet upon your arrival, to the kind-hearted and humorous natives we worked alongside of, there isn’t a single person working for Amizade who doesn’t truly have a passion for what they do. Being able to oversee the projects that Amizade has to offer from start to finish is a feeling that is hard to forget and leading this trip has given us some unforgettable experiences and lifelong friendships. Now, it’s your turn! Want to learn more about how you can plan your own Amizade journey? Visit our Plan A Program page or contact Anna Ciacco, anna@amizade.org.